Expanding your home's square footage with an addition is an exciting way to add living space. Several options exist, including screened-in porches, three season rooms and all season rooms. Each type of addition has its advantages and disadvantages. 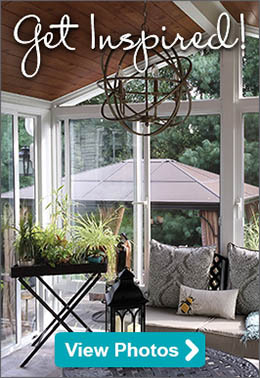 Screened-in porches are great during nice weather but not usable when temperatures drop too low. All season rooms offer year-round usability, but cost more to construct. A three season room however, works well for homeowners interested in additional square footage and extending their living space for the majority of the year. Three season rooms are additions enclosed with glass. Many rooms feature floor-to-ceiling windows with UV protection to protect both furnishings and occupants from the sun. These additions may start out as anything from a patch of grass in the yard to a patio or porch. They can be enjoyed most months of the year, however, because they are not insulated, they can't be efficiently cooled with air conditioning during the hot summer months or heated when temperatures drop in the winter. Three season rooms can be as basic or extravagant as the homeowner desires. A variety of construction materials are available so the space looks and feels like a true extension of your home. Next, we'll look at window and roofing options available for constructing a three season room to match your home's style and beauty. One of the greatest benefits to adding a three season room is creating an addition made of glass. This affords great views of the outside while opening up the inside space to natural sunlight. 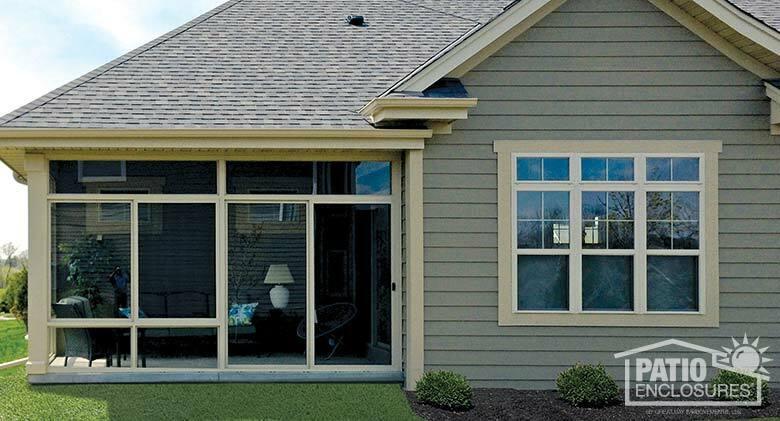 Single-pane windows are widely used to protect your addition from the elements while double-pane windows also provide a more consistent indoor temperature. Most glass features some type of UV protection from the sun's rays, and tints are a popular feature as they assist with glare reduction and shading. 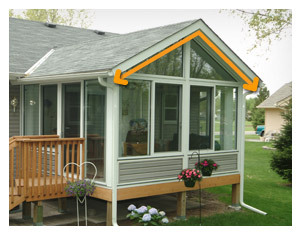 Patio Enclosures' three season elite rooms also feature additional weather protection to keep your new space draft resistant. An existing roof, if it's in good shape, can be used for a three season room. 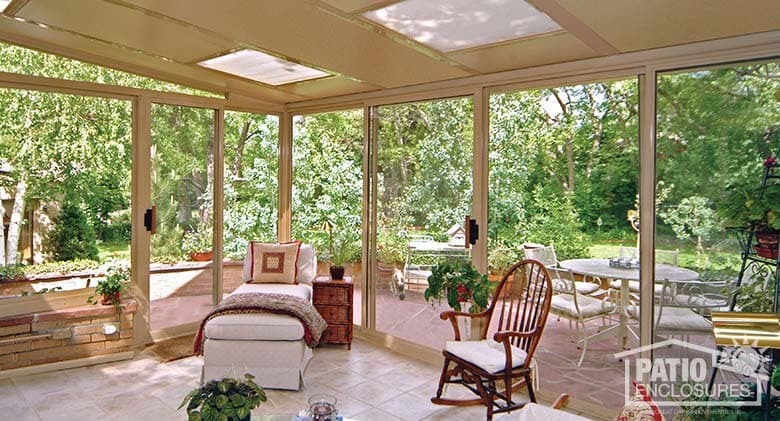 Patio Enclosures will simply construct your new living area beneath the existing patio or porch roof. Since our rooms are custom-made to fit the design of your choice as well as your home, we provide an addition that fits into your existing space perfectly. However, when a new roof needs to be built, our three season roof options include 3- or 6-inch-thick panels that insulate from weather and sound while providing structural integrity. Roofs can be constructed in a sloped or gabled style and glass roof panels can be added for those who want more natural sunlight. We also have a custom wood roof option for homeowners looking for a seamless blend between the new room and the existing structure. To set up a free in-home consultation, simply submit a request here, or contact Patio Enclosures at 800-230-8301. A professional design consultant will meet with you, evaluate your existing home and exterior space and recommend options that will work for your home's design and your budget. In the meantime, check out our photo gallery of past projects to get an idea of design choices.